On Friday I was fortunate enough to get to watch 13th, the new documentary from Ava DuVernay, and then hear her speak afterward. I have to admit it made me sick to my stomach and so sad; I cried throughout the film; but I am so glad this documentary 13TH exist. It is because once you watch this, you know that there are no more excuses possible for one of the most atrocious crimes of the North American history over more than half a millennium - slavery and its different renditions over the years, and as it is now know as mass incarceration and the criminalization of African Americans and Hispanics. Thank you Ava DuVernay for making this film! This is the most important film you need to watch this year, no, actually the most important film until we finally change things in this country. 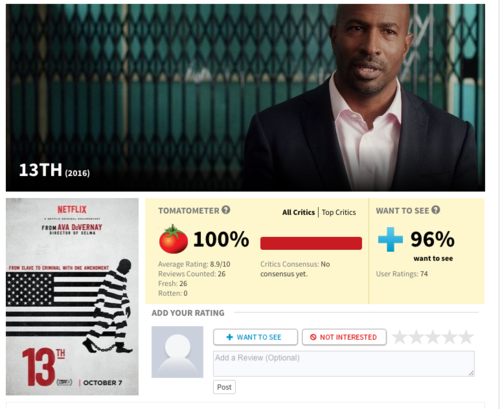 If you donâ€™t trust me, check out Rotten Tomatoes, who has already given it a 100% review. That happens as good as never! I feel very confident to say, Ava will win the Oscar for this and she rightfully should! And here are some clips from the Q&A with Ava. I know that her hope will be answered. If this film canâ€™t change things, then I am not sure what can. Please watch this film and share it!